Want an easy way to assemble a Christmas planner? Take a tip from blogger Cassadiva! Her comb-bound Christmas planner lies flat, yet is flexible enough to fold back for easy use. 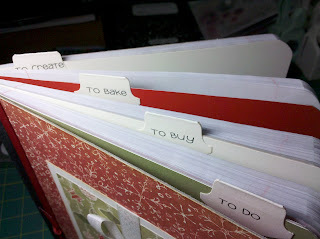 Cassadiva's assembled her personalized organizer from holiday planning templates from OrganizedChristmas.com. Using a binding service from her local office supply store to build her planner, she's created an efficient and easy-to-make planner option. Decorated with pretty cover pages, it's a functional and fabulous power tool for holiday planning. Good job! Christmas Planner to Christmas Album? Yes! What's better than a D*I*Y Christmas planner? A Christmas planner that uses scraps from the paper stash and recycles itself into a Christmas album after the holiday season. Check out this example of a ring-bound Christmas notebook from blogger Monika Wright. During the season, stock it with with printable Christmas pocket planner pages, and you have a scrappy Christmas planner for your organized Christmas. At season's end, replace planner pages with photos and journal entries for a clever, creative Christmas album! Monika's tutorial takes you through construction of this nifty entry in the Christmas planner field. Check it out! Amberlee, blogging at the Giver's Log site, is back for 2010 with a fresh new version of her handmade holiday planner. This free printable is the one for you, if you're looking for portable simplicity in a Christmas planner. Pocket-sized and pretty, it's a minimalist's version of a working holiday organizer. Best of all, Amberlee offers her design in both pre-filled (for those looking for direction) and fill-your-own versions. Nice! Lavish and layered and oh, so glorious: check out this Christmas planner from crafts blogger Cardsister! Sure, she's started with a simple composition book base, but this combination of coordinated patterned papers and layers of lavish die-cut elements is a knockout! 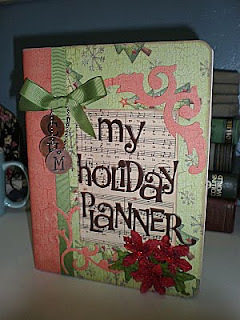 Add the sophisticated color combination, ribbon and chipboard letters, and you have a Christmas planner to die for. Zowie ... where are my Tim Holtz dies for the Sizzix Big Shot? P.S. This Westie owner ADORES Cardsister's profile pic! Start with a simple photo album from the dollar store. Add patterned paper, index cards and a bit of creativity, and what do you get? This delightful Christmas Planner from blogger Janelle at the Arizona Families blog. What we love about this? Simplicity! Using an inexpensive photo album as the base, users add standard-sized index cards to photo pockets to create a durable holiday organizer. Don't miss Janelle's advice about adding tabs. Using a paper punch makes it easy to make as many tabs as you need. Since you create your own planner, your tabs will be as unique and individual as you are! Simple, inexpensive and creative: a winner! What's the secret to Scrappin' Kat's elegant--and easy--altered journal Christmas planner? Combine coordinated patterned papers and cardstock, add an inexpensive composition book, and voila! A dashing entry in the Christmas planner field! The organizer in me loves her abundance of pockets. With four sections to the planner, top tabs--a real innovation that should avoid the "dog-eared" look!--and the appeal of simplicity, this Christmas planner glows!